In January, I posted a classic recording of the late Rirratjiŋu leader Wandjuk Marika playing yidaki. Thanks to equally legendary filmmaker Werner Herzog, we also have some great quality footage of Wandjuk playing. In this clip from the opening of the 1984 film ‘Where the Green Ants Dream‘ Wandjuk plays a snippet of brolga song. The film also features a few clips of song & dance. But no, in real life Yolŋu don’t ever freeze like that at the end of a dance. This may be a controversial statement, but those are the only good parts of the film. As a whole, it bears all the marks of an outsider with grand ideas telling Aboriginal People what to do instead of listening to them and letting them tell their own story. Wandjuk spoke about the experience of making the film as he narrated the book Wandjuk Marika: Life Story, as told to Jennifer Isaacs (which you should read). I was very sad and we were there for three-and-a-half weeks to make the Green Ant film… All my people was there and three of us is main ones: Roy, Wukaka and myself, Wandjuk Marika. 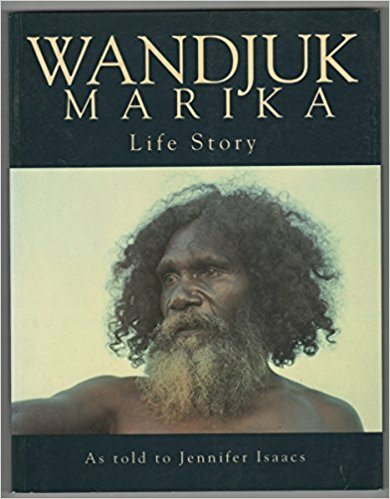 In the late 60’s and early 70’s, Wandjuk and Roy Marika signed the Yirrkala Bark Petition and played significant roles in Milirrpum v Nabalco Pty Ltd, Australia’s first ever land rights case, wherein the people of Yirrkala sued to claim ownership of the land they had lived on for untold generations. They of course lost. Their law was not recognized by the occupying government. This was a very tender sore spot for the Yolŋu People, and Wandjuk worried that the film’s re-enactment made a mockery of the real case that he cared so much about. Wandjuk also called out the phoniness of the story and complained about being directed by an outsider to make a mockery of Aboriginal law. The special film was the one I made by myself. I ask Ian Dunlop, he was working in Film Australia, my film is (In) Memory of Mawalan. 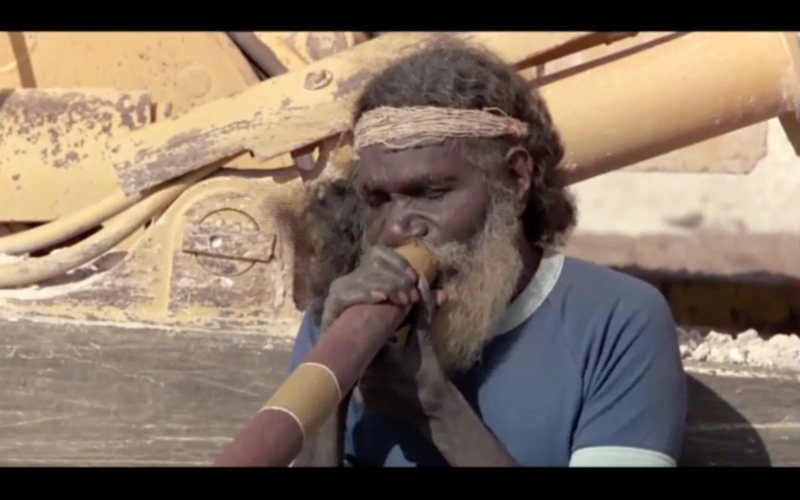 After his father Mawalan’s passing, Wandjuk instigated a large Djuŋguwan ceremony and invited Ian Dunlop and crew to film it as part of the Yirrkala Film Project. It’s a stretch for Wandjuk to say he made the film by himself, but we know what he meant, and how important the movement he began is. He was a large part of the founding of Buku-Ḻarrŋgay Mulka, Yirrkala’s own community art centre in the 1970’s. When we expanded it with the Mulka Project multimedia centre in 2007, we had the specific goal of turning modern media over to Yolŋu to tell their own stories from now on. The way Wandjuk would have wanted it. See how I drew you in with yiḏaki then made this post all about larger cultural issues? Tricky, eh? Thanks for the candid review Randin. Too bad these Balanda can’t leave well enough alone. Don’t know why the Yolgnu people consented to work with them under those circumstances. Well, they were paid and Wandjuk envisioned using the funds to set up a permanent home on ancestral land at Yalaŋbara, away from the negative influences of the mining town near Yirrkala. They went out there a lot, but nobody has lived there full time for long. The film’s credits list a southern Aboriginal actor & activist as “ethnologist” on the film. I wonder what role he played and whether he’s ever commented on this issue. Wandjuk’s last wife, a non-Aboriginal Australia, is listed as “Aboriginal Liaison.” I only met her a couple of times. If I ever do again, I’ll try to get up the nerve to ask about this. The Aboriginal people and their culture were cheated again!-This time by a very controversial German film maker. To be fair, the film shot 35 years ago. I didn’t write this just to condemn Herzog all these years later. The world has changed a lot since then and he undoubtedly has with it. But we all need to be aware of this issue for ourselves. Any of us who go to Arnhem Land have some agenda of our own, and no matter how we try to control it, our very presence is an external influence. That was the puzzle for me living and working there. Trying to be helpful and true to myself, to work with Yolŋu to create projects that they wanted to do and in which they could be true to theirselves. Randin, thank you for your tricks! I always appreciate your knowledge and experience and your willingness to share it. I hope you are well. Thirty five years ago.? That is a long time. I hope all of the work you and the Yolgnu did together helped to correct some of the damage.